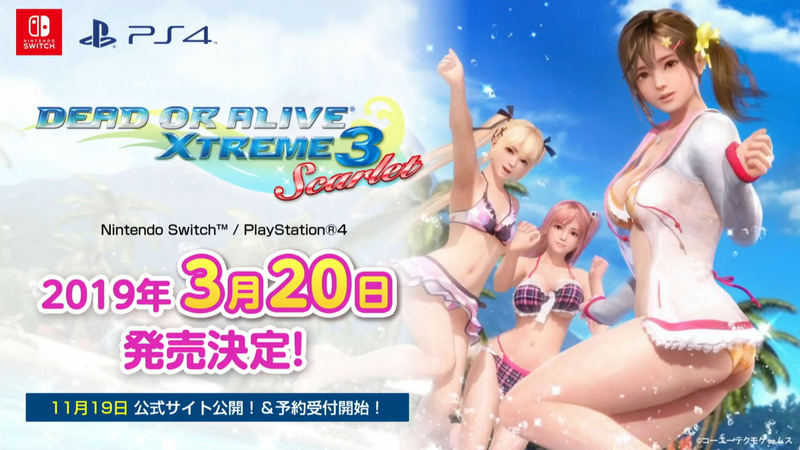 During the Dead or Alive Festival 2018 in Japan, publisher Koei Tecmo announced Dead or Alive Xtreme 3: Scarlet, to join the already-existing Fortune and Venus versions released in 2016 on PS4 and PS Vita, respectively. The new version is set for release on March 20, 2019 on PS4 and Nintendo Switch in Japan. Dead or Alive Xtreme 3: Scarlet will include Misaki, a new character who first appeared in DMM’s Dead or Alive Xtreme: Venus Vacation browser game on PC. Pre-orders along with the game’s official site will go live on November 19 JST. With the game just announced, it remains to be seen if there will be an Asia English release like with the other versions of the game.